How do I get the latest Echo Information? 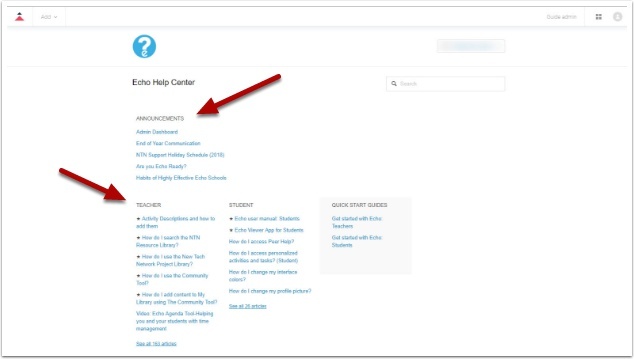 Schools who have member accounts to open Echo Support tickets, have the option to "Follow" categories to stay up to date on the latest addition in the Echo Help Center. Access the Echo Help Center by going to: help.echo-ntn.org. Select the category you wish to follow. Echo team recommends for Echo Admins to "Follow" Announcements and Staff to follow Announcements and Teacher. Once category has been selected, click on the drop down "Follow". When articles are updated and/or when new ones have been added, Echo Help Center will send you an email notification. How do I stop following articles? If you no longer wish to receive notifications, return to the category and select "Unfollow".